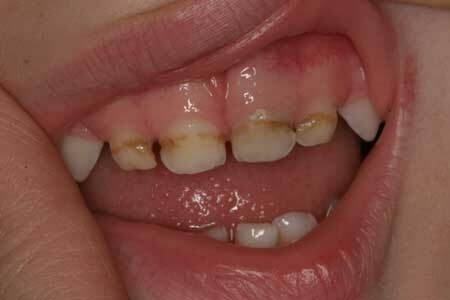 Early Childhood Caries (ECC), sometimes also called “bottle decay” is a phenomenon we still have only poorly understood. Nevertheless, it is pretty widespread. It is frightening for many parents to notice their 2-4 year old children developing widespread cavities on their front teeth All this in spite of the fact that they may be extremely cautious with their diet and oral hygiene. In the past, Early childhood caries was attributed to the fact that babies were sucking on their formula milk bottle in bed and going to sleep with it, thus creating an environment for the decay-causing bacteria to thrive on the pooled and fermenting milk on the surface of their teeth. This has changed today and there seem to be other aggravating factors. Thorough attention has to be given by parents to keep the teeth clean from the bacteria that cause this condition. Diet, as well as proper oral hygiene, Xylitol gels, possibly combined with some homeopathic remedies, as well as proactive dentistry can all be used to prevent or slow down this condition. ECC develops as a result of very early colonization of the baby’s mouth with streptococcus mutans bacteria. The bacterial colonies covering the teeth, known as plaque, will process sugars coming into contact with them and produce acid as a by-product, which in turn will cause enamel to become softer and porous. These white chalky lesions will then progress into the more advanced decay seen in rotting teeth, especially in upper incisors of children between the ages of 2 and 4. Recent research has shown that neither breastfeeding nor its duration are associated with the risk for early childhood caries. On the other hand, increased risk of ECC is often independently observed in associations with poverty, and maternal prenatal smoking. Furthermore, some ethnic groups were independently associated with severe early childhood caries. This entry was posted in Child Dentistry and tagged Aggravating Factors, Bacteria, Bacterial Colonies, Breastfeeding, Cavities, Colonization, Decay, Dentistry, Early Childhood Caries, Enamel, Formula Milk, Front Teeth, Homeopathic Remedies, Lesions, Milk Bottle, Plaque, Proper Oral Hygiene, Rotting Teeth, Streptococcus Mutans, Upper Incisors by Admin. Bookmark the permalink.